Malope plants are hardy annuals that reach up to 90 cm in height. They have captivating lobed leaves and trumpet flowers of pink or white that come into bloom throughout the summer. 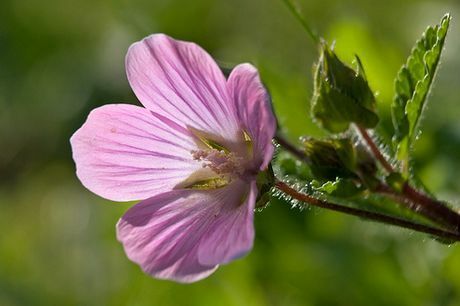 The common name for Malope is Mallow wort. Malope malacoides by Sarah Gregg; Creative Commons. Malope trifida by photon ? ; Creative Commons. 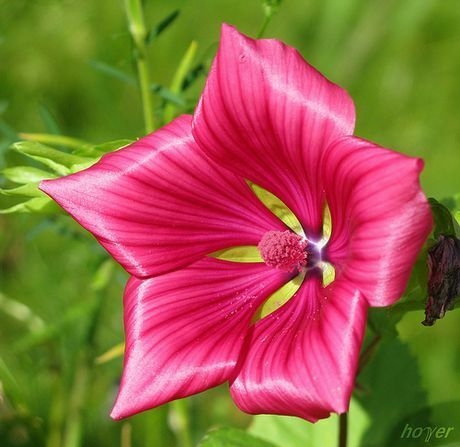 Common Names: Mallowwort, Annual Malope, Purple Spanish Mallow, Maloppi. Growing Region: Zones 5 to 10. As a perennial in zones 8 to 10. Flower Details: White, pink. Trumpets. Cup-shaped. Flowers reach 2.5 inches (7 cm) in diameter. Sow Outside: Cover seed. Before last frost. Spacing 10 to 20 inches (30 to 60 cm). Sow Inside: Mix seeds in a growing medium, place in a freezer bag, keep moist, then stratify by refrigeration for three weeks. Use peat pots. Germination time: two weeks to one month. Temperature 70 to 75°F (21 to 24°C). Five weeks before expected last frost. Transplant outdoors following the last frost. Requirements: Full sunlight or light shade. Good drainage. Light soils. Provide support. If you plan to grow mallow wort from seeds outdoors then they should be sown a few weeks before you expect the last frost of spring. Once sown the seeds of Malope Plants should be lightly covered. Mallow wort and other Malope genus members can be grown in both sunny and partially shaded parts of the garden that have good drainage. 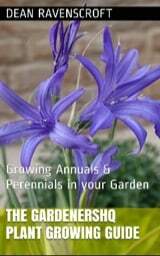 They prefer a light soil, if you require lots of foliage then grow in a richer soil. Mallow wort can be started indoors. The seeds should be imbibed by placing the seeds (within soil) in a plastic bag, then placing in the fridge for three weeks. After this period remove from the fridge and germinate at 18 to 24 degrees; it takes about two to four weeks to germinate. Once growing transplant the Mallow wort at between 30 cm (small varieties) to 60 cm (large) apart. Mallow wort and other Malope plant species basically look after themselves, though bigger species may require staking.